Sizing 6 to 14. 6 to 14. 8 to 14. 6.5 to 13.5. 6.5 to 14.5. Dimensions 18 x 8 x 18 inches 12 x 8 x 4 inches. N/A. N/A. N/A. Weight 10 pounds. 7 pounds. 6.2 pounds. N/A. N/A. How to Select the Best Chainsaw Safety Boots? When you’re operating a chainsaw, any old footwear won’t do. You need something that offers protection, can withstand the demands plenty of walking, and has the stability you need for safe chainsaw operation. In this buying guide you will notice several different chainsaw boots – all with varying features, intended uses and price tags. 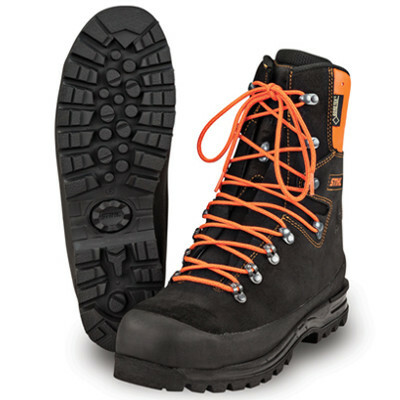 By establishing what you need your boots for, you can then choose the best boots for the job. Chainsaw boots have to be hardy to withstand a lot of pain in natural environments. However, the level of durability needed all depends on the work you will be carrying out. Will you need to walk for several miles in rugged terrain? Or will you simply be felling trees on level, landscaped grass? Once you establish your work type, you can then look at finding the best chainsaw boots for the money. This buying guide aims to show you several top rated options to help make the purchasing process a little easier. When exposed to mud, grass, saw dust, tree sap and all sorts of grease and grime, boots can become damaged or dirty. Some brands will enable you to put them in the washing machine, whereas others require you to use a fine brush and a sponge. Some chainsaw boots also come with separate parts that can be replaced. Review your options and find out which level of maintenance will suit your time restraints. If you’re going to be doing a lot of walking and/or climbing, you are going to need chainsaw boots that fit the bill as reliable. Chainsaw boots should have quality stitching, they should withstand the pressure put on them by nature, and they should be easy to walk in. Most importantly, they should also be protective. Compare and review several brands in order to find the best chainsaw boots for the money that are durable and safe. Depending on the brand and quality, chainsaw boots offer a range of features not often found on a standard pair of shoes. In many cases, a more expensive boot can mean better quality, more durability and more safety features. However, this is not always the case. Always read reviews carefully and take note of the five options in this buying guide. Make comparisons between many different brands to find a happy medium in cost vs. features. Always remember to choose quality over budget, but don’t spend more than what a pair is worth. The best deal can always be found online on websites such as Amazon – and normally within your budget. 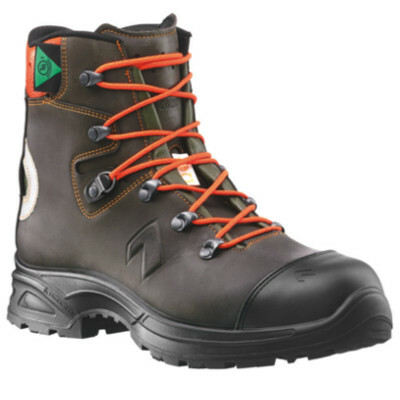 These boots feature styrene-butadiene rubber and cotton canvas lining for durability. They have chemical resistant natural rubber uppers for safety. They have oil, chemical and slip resistant nitrile rubber lug soles. They offer achilles tendon and ankle protection. They are comfortable with air-cushioned heels. They have steel toe protection. They have a competitive price tag. The top cuff is narrow which makes putting them on and taking them off difficult. There are no suitable female options. QWho are they suitable for? AArborists, harvesters and forestry professionals. QIs the whole front of the chainsaw boot chainsaw resistant, or just the steel toe? AThe entire front apart from the black strip along the top. QDo the felt liners come with the boots? If you want to feel safe and protected out in the field, these boots are the answer. They are hardy, durable and provide full frontal protection from chainsaw cuts. 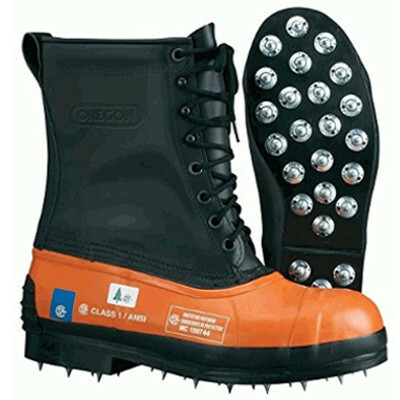 The steel toes also give users more confidence that if they drop logs on their toes, they won’t injure themselves. The rubber is very durable, does not crack, and is comfortable against the user’s legs. The only real downside to these boots is the top cuff. It’s very narrow which makes putting them on and taking them off difficult. Overall, these are some of the best chainsaw boots for the money. Check out what other people who purchased this product think about it. Read Viking Footwear Class 2 chainsaw safety boots reviews. They are compatible with ice studs. They feature a nylon cuff to prevent debris getting inside the boots. The heel is cushioned for comfort. They offer ankle, metatarsal and achilles tendon protection. The soles are chemical, oil and abrasion resistant. They are a smaller size than most other brands. They don’t include the felt liner. They are quite unaffordable for many homeowners so are more suited to professionals. The chain protection foam can move and rub against your leg which can hurt after a period of time. Dimensions: 12 x 8 x 4 inches. QWho are these boots suitable for? AArborists, construction workers and forestry professionals. QDo they have steel toes? AYes, steel toes and plates. QDo they include the felt liners? 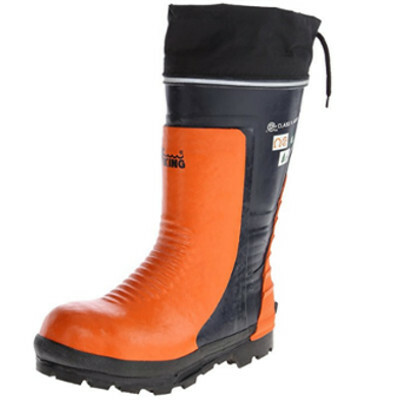 Although they are priced a little high on the market, they are very durable and comfortable boots which many users love. They last a long time, provide top level comfort and do the job they are intended for. They also offer several layers of protection as well as being waterproof and compatible with ice-studs. They are an all-weather boot which quite obviously stands the test of time. Overall, they can easily be considered some of the best chainsaw boots for the money. Check out what other people who purchased this product think about it. Read Viking Footwear Bushwacker chainsaw safety boots reviews. They protect shins, ankles, feet and toes. They have a caulked sole for better stability on rugged terrain. They have steel toes for even better protection. The laces are prone to breaking and can take a while to do up. They aren’t easy to put on and take off. QWhat does the caulking achieve? AIt gives you more traction on rugged terrain. QAre they electric shock resistant? QDo they have steel caps? 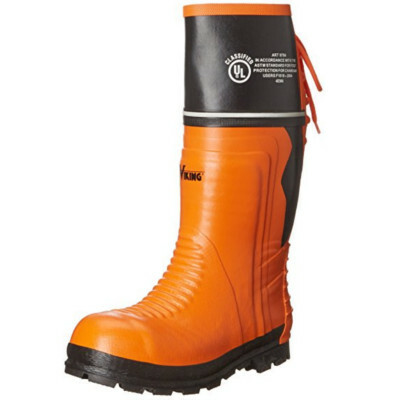 These caulked chainsaw boots provide optimum protection for those forestry workers who work in tough terrain. They offer shin, ankle, feet and toe protection, as well as having steel toes to provide the wearer with more confidence. They are constructed of quality materials and are extremely well priced on the market. Reviews have been positive for these boots so overall they are some of the best chainsaw boots on the market. Check out what other people who purchased this product think about it. Read Oregon 537310-12 chainsaw safety boots reviews. The steel toe cap is well padded. The insole and arch system is well supported for comfortable wearing. The insole is flexible and absorbs moisture. The leather is high quality. The bright colored laces get dirty very easily. QWho are they best suited to? AHomeowners and industry professionals. They are very versatile. QAre the toes steel cap? Suitable for a wide range of users, these STIHL performance boots for sale hold their place in the market well. They are durable, offer premium levels of protection and are made of quality leather to be long-lasting. They also have steel caps and are cut and puncture resistant. Designed to be comfortable when you’re on your feet all day, every detail has been thought of in this boot’s construction. They are easily some of the best chainsaw boots for the money. Check out what other people who purchased this product think about it. Read STIHL Performance chainsaw safety boots reviews. They offer padded steel toes. They are largely made of black suede material. The orange laces can get dirty easy. The laces are known to break easy. QWho are they targeted towards? AProfessionals and those with light tree cutting duties. If you plan on doing plenty of walking in rugged terrain as a professional forestry worker, you could purchase no better than these STIHL Pro Mark professional chainsaw boots. Hardy, durable and capable of operating to their full potential in many different terrains, they are everything you could want them to be. They are top rated and very well priced on the market. In comparison to some other makes and models they are also very unique in design as well as comfortable. Overall, these boots will make any chainsaw operator very happy. Check out what other people who purchased this product think about it. Read STIHL Pro Mark™ chainsaw safety boots reviews. Where to Buy Chainsaw Boots? Chainsaw boots are available for purchase both online and in leading hardware and chainsaw stores. The best brands are available at highly competitive pricing mainly online. You can get the best deal by making comparison between brands with varying features on websites such as Amazon.